Refined ConnectTags allow meeting rooms and content in Adobe Connect (AC) to be linked directly to the LMS. 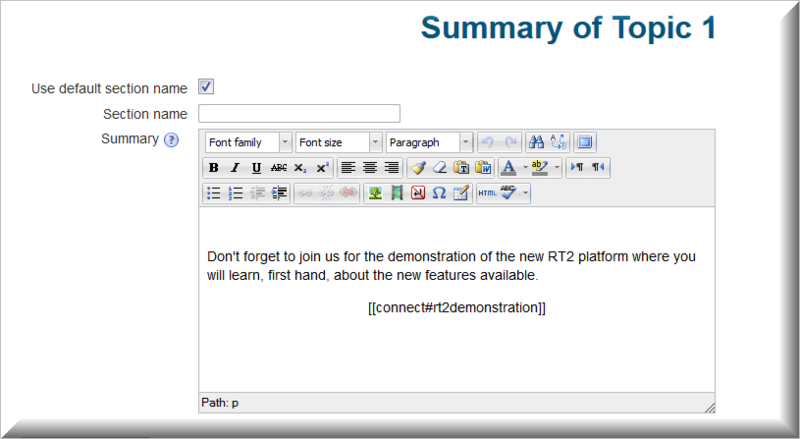 In sites running RT3 and higher the Connect Activity setup allows for all theses basic options without the use of tags. Although you may like to use the tags to embed content within HTML edits providing versatility and more control of the iconic display and text for the activity when using HTML to design the appearance of course content. Administrators and editing teachers may use Refined Connect or Video Tags on the front page of the site or inside courses. On the front page or in a course, Refined Connect Tags are used in labels or topic summaries to provide an iconic link to AC from the LMS, while Refined Video Tags link to video content from anywhere on the internet, including AC. Not only does the activity icon launch the presentation or direct the user into the meeting room, it provides useful editing tools. 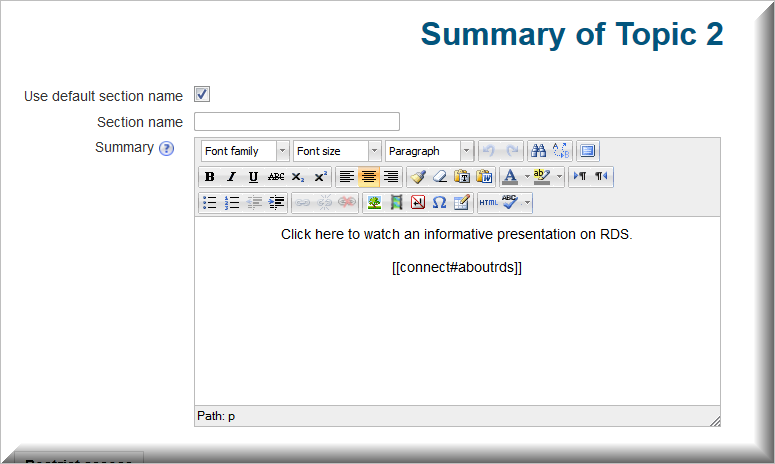 To use a Refined Connect Tag in a course, Turn editing on then either click on the Topic editing icon or click on Add an Activity or Resource >>> Resources>>> Label. In either case, you will type the Refined Connect or Video Tag (described below) into the HTML editor field. On the front page of the LMS, go to Settings>>> Front Page Settings>>> Turn editing on. Depending on how your Front Page is set up, you may be able to edit a topic summary or add a label as in a course and incorporate Refined Tags. String the separators together (#####) to leave the settings set to the default. This concept is explained in Modifying the Refined Tag Icon Appearance. Notice that just the customized portion of the URL (after the final / ) is the part used in the Refined Tag. 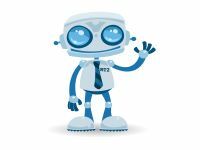 The custom URL component is case-sensitive and must contain alpha-numeric characters, hyphens and underscores only; it must start with a letter, not a number. The hash tag sign # must separate each component or the tag will not be interpreted correctly. The Refined Tag has been replaced with an icon representing the meeting together with all the relevant information about that meeting. This includes the meeting name, the start and end times, and any telephony information required to dial into the event. The times are automatically recalculated so they are always displayed in the participant’s own time zone. Date information is displayed only for events in the future. Phone information is displayed only if it has been included when setting up the event in AC, although the configuration option for Connect filters can suppress phone information if desired. 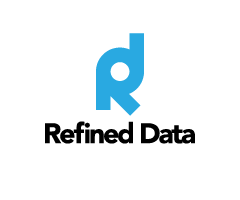 Phone information only works for integrated telephony adaptors, including Refined Data's rPhone product. To enter the meeting room, the user need only click on the icon or the informational popup. 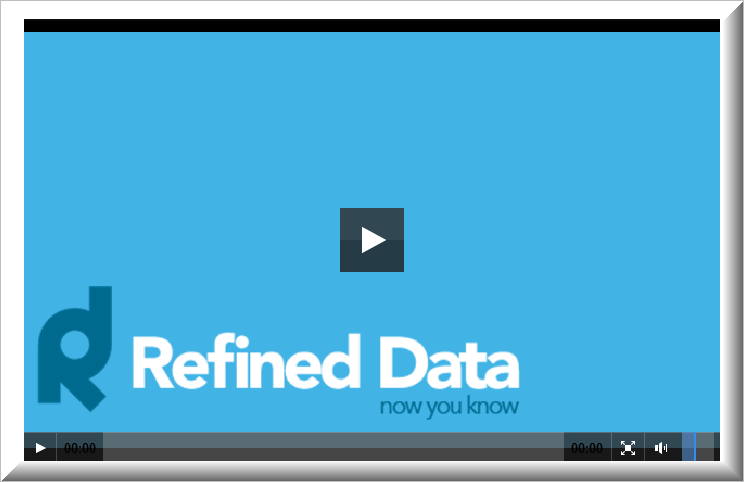 Refined Tags can also be used for recordings, Presenter slide decks, and Captivate presentations along with any other content that is uploaded to the Connect server. It will automatically work out the kind of content the custom URL refers to and displays the appropriate icon and options. There are several modifiers (flags) available to alter the appearance of the icon and text displayed for AC meetings and content. These modifiers are placed as a third element by using the hash tag # to separate the components in the Refined Tag being created for the meeting room or content. Silent output. Icon only, no text. Allow guest access to the content. Do not show phone numbers. For meetings, always show room. Default is to link to recording if it exists. Suppress the mouse over the menu unless in editing mode. Following the sizing and flags use additional separators to insert the dates. Displays the content between the start date (1st) and the end date (2nd). The dates follow the URL and/or any modifiers. Run the separators together to leave settings set to their default. Following four separators extra text can be created. It includes extra html text within the description of the event. This information follows the URL, any modifiers and dates. Add an additional separator to link an icon that will replace the default icon at the end of a Refined Tag. Insert an image to replace the default iconic display. The information follows the URL, modifiers, dates and extra text. Edit this Resource at Adobe Connect Central – launches AC and goes directly to this resource (meeting or content) to allow you to review or alter the information about it. View Meeting Attendee List – displays a report of the attendance of a meeting. It displays all attendance from the last 6 meetings that have been held in this meeting room; does not appear if no meetings have been held. Email Meeting Details – creates an email with a link to this meeting and details. You can then send this as an invitation to as many users as you like. Note that use of the video tag following the release of RT3.4 is limited to pages that are not using the Refined Video activity. If you are using the Refined Video activity then adding this flash video tag to the same course page will result in an error not allowing the activity video to play. 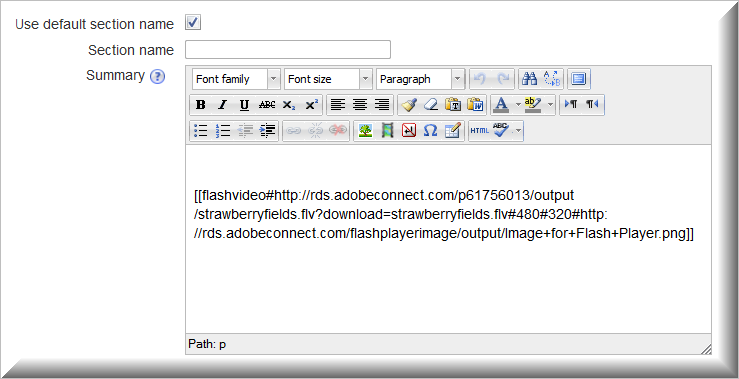 This Refined Tag displays a video file in a video player (either a Flash player or a JWPlayer, depending on how your site has been set; see below). This URL for the video can be located anywhere and not just inside Adobe Connect. To obtain the correct URL from a video stored on AC, you need to click on the Download Output File tab and then right click the content link and then click on Copy Link Location.